Six well-behaved six-year-olds are the social equivalent of six hundred angry Bolsheviks. 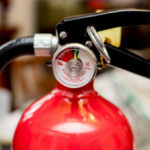 As you may have heard, Kidde has recalled some appallingly huge number of fire extinguishers, whose plastic parts may not hold up to actual use. If you have one, you can still get it replaced, details here. I had three. Mine were very old (I really should have replaced them, or at least had them tested and refilled, a decade ago), but the model numbers were listed in the recall. I entered a claim on the website (with serial numbers as well), and they accepted it. Well, late last week, the three replacements came. They’re physically smaller it seems to me (definitely shorter), have metal parts everywhere at the top (except the hose), have a metal rather than plastic mounting bracket, and have a higher rating than my old ones (3A rather than 2A, the new are 40BC, old might have been just 20). They do want me to ship back the old ones. The same packaging works, and they provide pre-paid shipping labels. I have no idea if they’re asking for all of them back, or if mine are so old they’re suspicious whether I really have them, or whether I happen to be one of the people randomly chosen to send them back so they can be examined. Whichever, they make it very easy, just re-use the same packing and stick on the label and call FedEx. And I’m getting more than $100 worth of new fire extinguishers for free that I should have bought myself some time ago. I did have some idea of maybe discharging one of the old ones for training (read play) purposes, but since I’m shipping them back I didn’t. I’m not really clear how they can survive this scale of recall financially. They seem to be covering even very old models that have the problem. Oh, and the CPSC page linked above says one death reported. 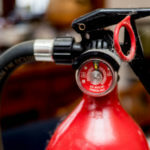 While one preventable death is bad of course, that’s not very many to base a decision to categorize a very widely-deployed piece of safety equipment, manufactured for decades, as severely defective to the point of needing recall. 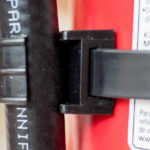 I suspect these defective extinguishers have saved hundreds or thousands of lives. I don’t know the numbers on either side of this or any other recall, I don’t really have any definite opinion whether it’s clearly right, clearly wrong, or somewhere in the debatable area. I’m just glad to have gotten my fire extinguishers updated for free. 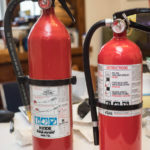 Old (recalled) and new fire extinguishers. The new one is considerably shorter, and rated higher (3A rather than 2A, and 40BC). Old — all-plastic top, levers, pin, etc. New — metal fittings, pin, and levers. 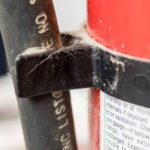 Old hose retaining clip is just barely retaining, as you can see. New has better hose retaining clip.